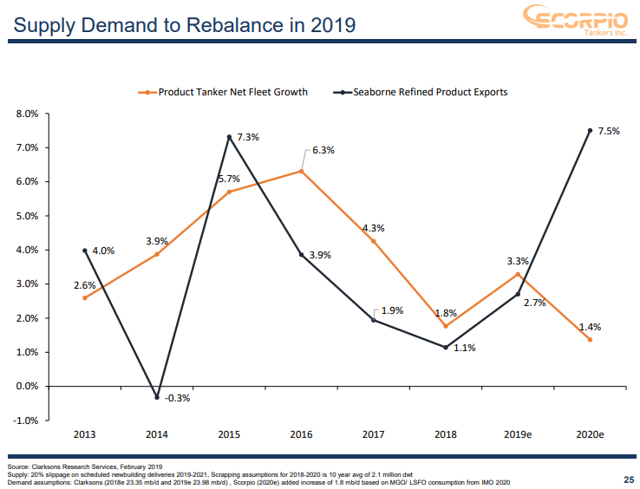 The product tanker market hit rock bottom in 2018 and has already started to come back a bit. Supply is constrained on many levels and demand is picking up. 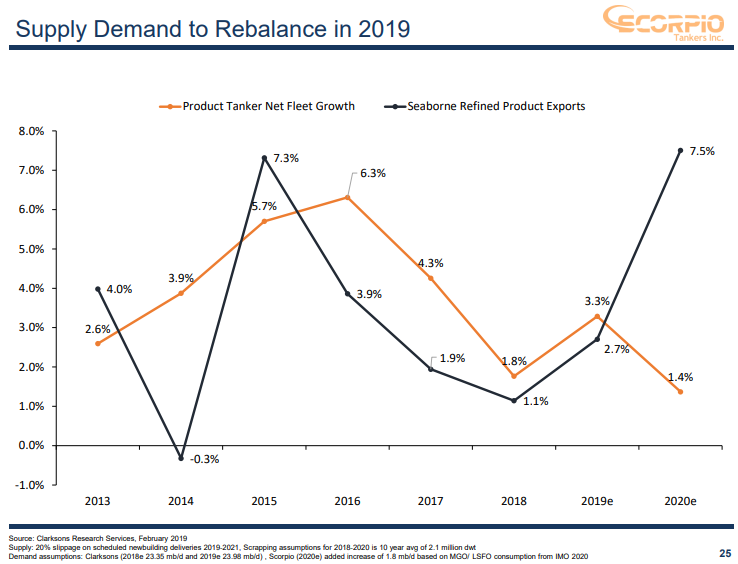 Apart from the industry's bullish fundamentals IMO 2020 is an upcoming catalyst that will boost product tanker charter rates for a long time. Scorpio is a great way to benefit from these trends as it will benefit greatly due to its operational leverage. Despite the shipping industry's reputation Scorpio Tankers isn't as risky as one would expect. It has a strong balance sheet, management with skin in the game and one of the best fleets in the market. The bull case for Scorpio Tankers (STNG) is pretty straightforward and well articulated by the company itself. Shipping is a commodity business and it is governed by two main factors. Vessel supply and cargo-moving demand. 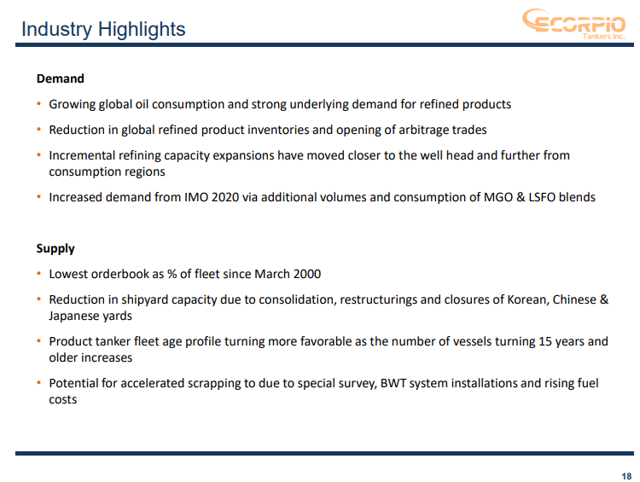 A dwindling supply of new vessels, increasing demand for refined products and the effects of IMO 2020 (which I outline here). The new regulation is effectively restricting the vessel supply and creates demand for product tankers as the new standard (low-sulfur fuel) is a distillate product and thus transported by product tankers instead of crude oil tankers that transport the currently used high-sulfur fuel. The last two slides build the case that a large part of the product tanker fleet (not Scorpio's but the general product tanker market) is aging and thus will be scraped or change use over the coming years. This is driven by the fact that ships older than 20 years are subjected to more frequent inspections, are uneconomical, and are widely avoided by charterers. Usually, once a ship reaches that age threshold it either gets scraped or transitions to carrying "dirty" products (crude oil, high sulfur bunker fuel, etc.). Ship age matters in other respects also, as the more modern ships are more fuel efficient. Also, a company can invest in them since they have a lot of productive years ahead. 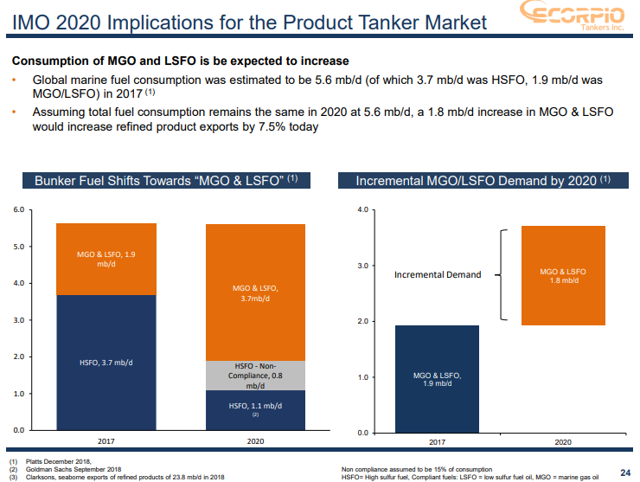 Scorpio Tankers has done exactly that in its response to the coming IMO 2020 regulation. The company has decided to comply with the regulation by installing scrubbers to most of the ships in its fleet. Scrubbers allow ships to continue using high-sulfur fuel which currently is about $200 cheaper per metric tonne from the low-sulfur fuel that is currently available. 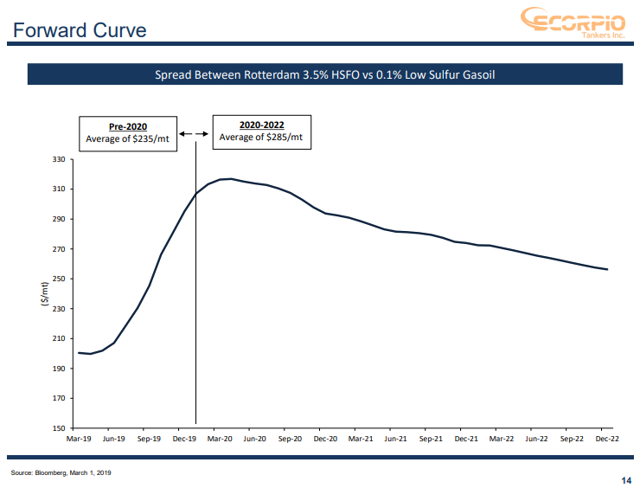 The spread is cost-based as the high-sulfur fuel is a residual product (it is a by-product of creating other refinery products) while the low-sulfur fuel is a distillate. Due to the disruption caused by the IMO 2020 transition, and the decline in demand for high-sulfur fuel (as only a small part of the fleet is expected to install scrubbers) the price spread is most likely to widen significantly in early 2020. Then it will probably taper off as economies of scale and standardization lower the cost of the new low-sulfur fuel. This projection scenario is depicted in slide 14 above. Since scrubbers will be installed to only a small part of the world's commercial fleet, charter prices will rise as shipping companies pass through the increased fuel costs. Slide 15 demonstrates the savings generated by a scrubber per type of ship. 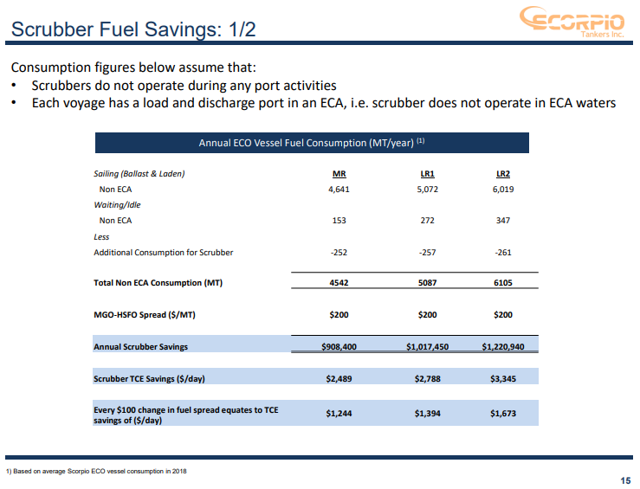 Given that a scrubber costs about $2.2 million per ship (including installation), it is clear that if the spread holds, the scrubber will be fully amortized in 2 to 3 years. After that whatever price spread exists between the two fuel types will become a margin booster for Scorpio and a clear competitive advantage. Also, due to the fact that Scorpio's fleet has an average age of 3.5 years, investing in scrubbers still makes sense even at a spread of just $50 between the two fuel types. In this case the amortization period would be 8-10 years, well within the useful life of the ship. Now let's take a look at what all these mean valuation-wise. 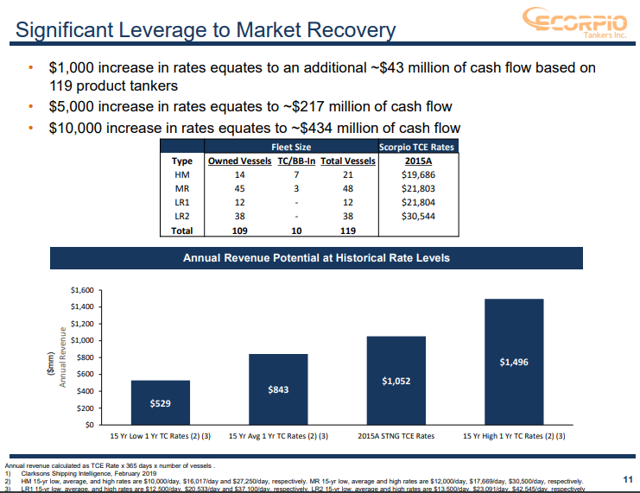 According to the company, every $1000 increase in daily rates equates to about $43 million of cash flow. They also provide revenue estimates for various rate levels. At the 15-year low of daily TCE (Time Charter Equivalent) rates the company expects about $529 million of revenue (a little below 2018 revenue). At the 15-year average $843 million. At the 15-year high, $1,496 million. As you can see in the table below, rates in Q4 2018 (as reported in their Q4, earnings release) were well below the 15-year average. However, in Q1 2019 they have risen significantly and are a little below or above the 15-year average. 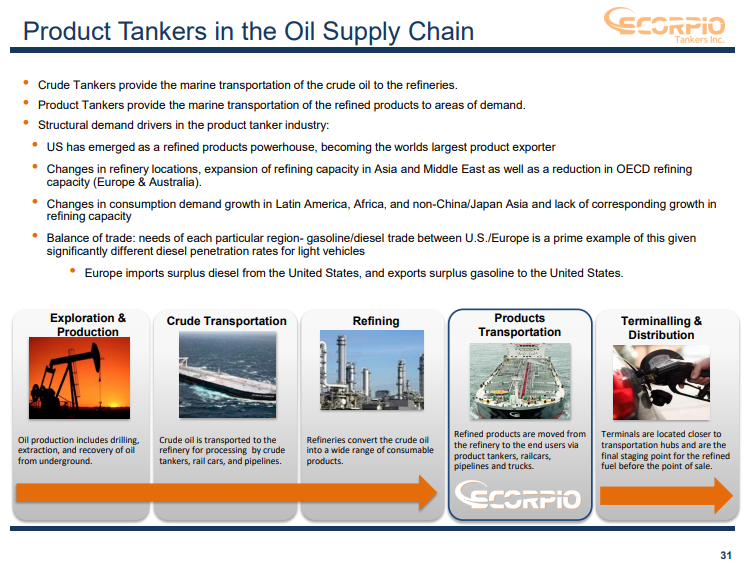 This means that according to management Scorpio Tankers is at an $800-$850 million revenue run-rate. This is 28%-37% higher than 2018 and most of the catalysts that were mentioned so far have not kicked in yet. Based on its 2018 annual report the company needs at least $580 million (operating expenses+financial expenses-depreciation) to be cash-flow neutral and about $750-$800 million to break even on a net basis. 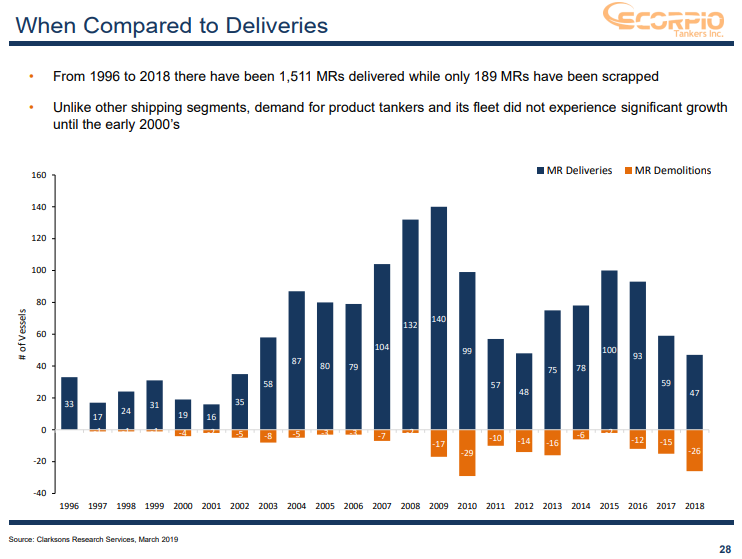 This means that at current rates Scorpio Tankers is poised to generate about $220-$270 million of operating cash flow and about $50-$100 million of earnings. 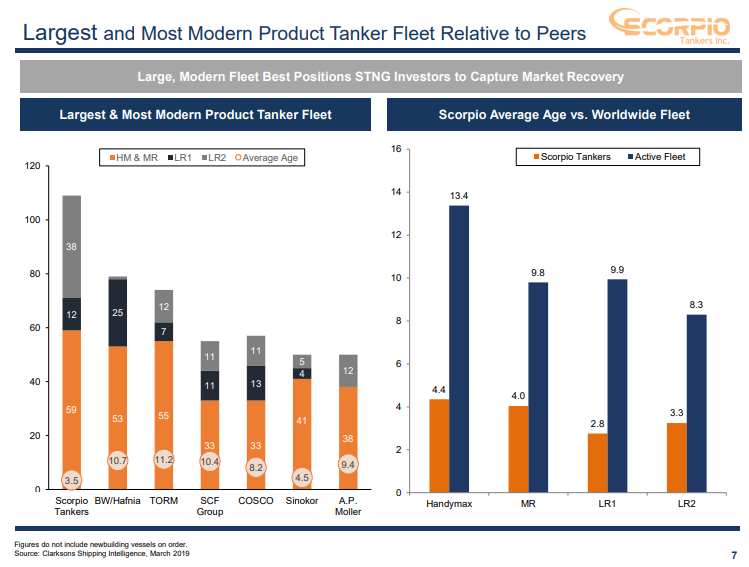 Below I have a table that demonstrates the massive operating leverage of Scorpio Tankers (which applies to most shipping companies). Even a small 10% increase in current rates will generate a lot of incremental cash flow allowing for debt repayment, share repurchases, or a bigger dividend. Some of the scenarios may seem absurdly optimistic but they are anything but when IMO 2020 takes effect the upward squeeze in rates will be anything but small and gentle. In the shipping market moves are many times extremely fast and violent. And given the restricted vessel supply, rates have a decent chance to stay elevated for a few years creating massive value for the shipping companies and their shareholders. I don't claim to know how high the rates will eventually go (or even if they will rise from current levels at all) but the fact that they have already risen to the current levels is a pretty good sign. Especially since IMO 2020 has not taken effect yet and the bulk of the scrubber installations that are expected to take offline a part of the fleet in the second half of 2019 have not yet occurred. Before I move on to the risks that investing in Scorpio Tankers entails, let me close the bull case with a video of the product tanker panel from the 13th Annual International Shipping Forum that took place in New York on April 1st, 2019. One of the speakers is Mr. Robert Bugbee, the President of Scorpio's board of Directors. The shipping industry is well-known among investors for its bad governance and overall capital destruction mainly through overinvestment and oversupply. 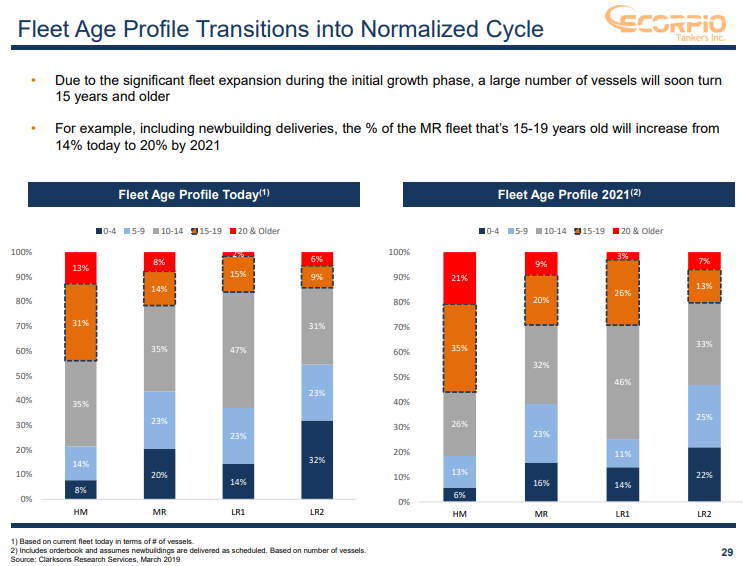 For the past 11 years, the shipping industry has taken advantage of the low interest-rate environment to build as many ships as possible pushing charter rates to barely cash-flow positive and unprofitable levels. But as the market adage goes "the solution to low commodity prices is low commodity prices". This means that the depressed charter rates destroyed a lot of capital and lead to an almost universal financing drought in the sector, which lead to multi-year lows in ship orders. Which is one of the main pillars of the bull case as we saw above. When lending dries out one of the most common funding sources for a public company is secondary offerings. However, Scorpio has already done one towards the end of 2018 and it is currently awash with cash. As of February 13th, 2019 the company had $607 million in cash which is about as much as the company needs to match its debt maturities until the end of 2020. This is comforting only up to a point though. 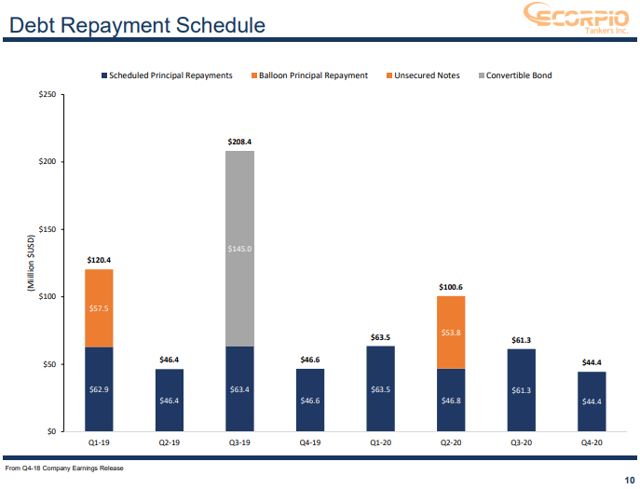 If rates plunge again below what the company needs to service its debt, a new dilution round is almost certain, despite the fact that management has significant skin in the game along with shareholders. 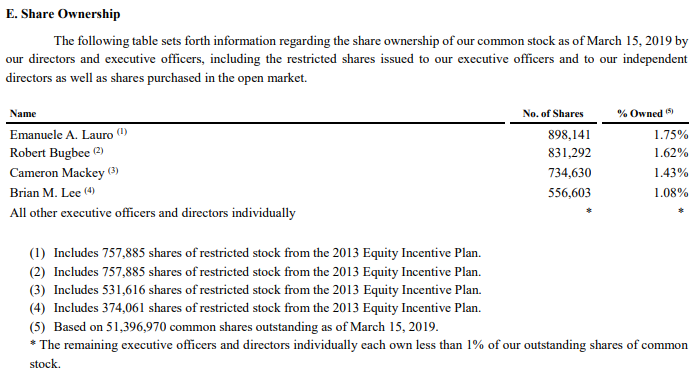 The company's balance sheet is in very good shape after the last capital raising. Apart from the market's supply and demand dynamics IMO 2020 provides a timely catalyst to the bull case. 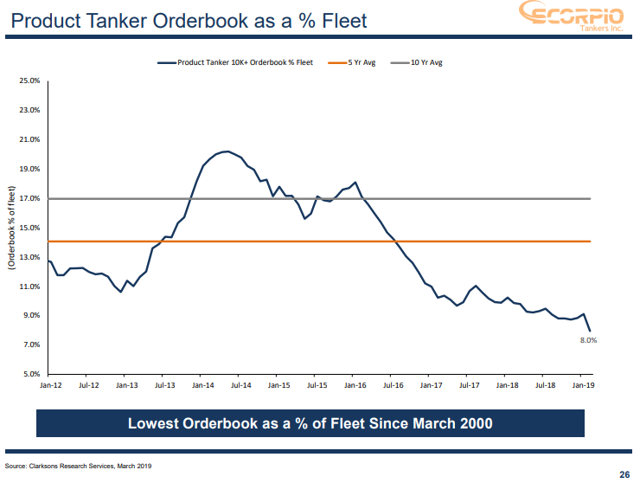 Product tanker charter rates seem to have already started their upward movement contrary to industry expectations (see the video above). Short of returning to last year's abysmal rates (which were at 15-year lows) the downside is limited as Scorpio is cash flow positive at current rate levels. If rates rise to their previous highs or even go beyond, Scorpio will definitely be a multi-bagger. Despite the various risk-mitigating factors though, Scorpio Tankers is an investment that warrants caution. It may indeed turn out to be a once-in-a-decade opportunity. Or it may prove to be just a good run for a few quarters. Or just another story of capital destruction in the shipping industry. 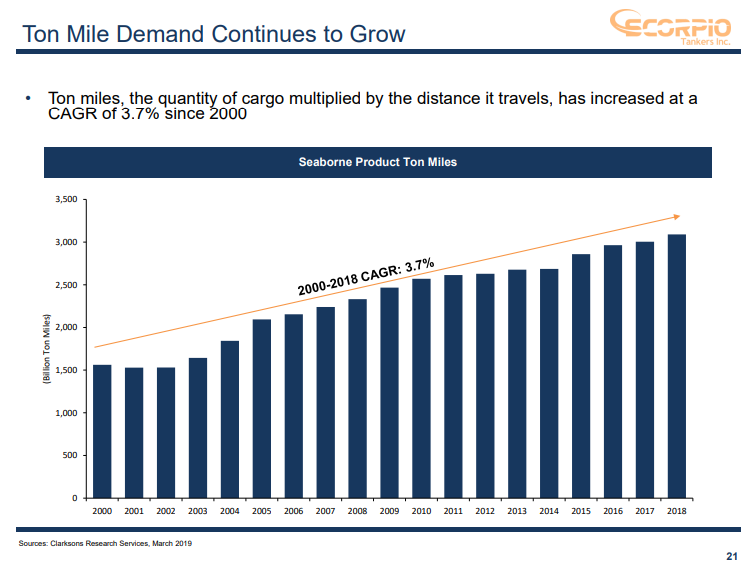 My money is on the once-in-a-decade camp but this is the shipping sector we're talking about. Which, in my opinion, is probably the second riskiest sector in the market apart from mining. 1. It must be perceived by the market as risky while it is anything but. 2. It must have multi-bagger potential and be profitable even in a not-so-good scenario. 3. It must have a time horizon of up to five years. Join now and get a FREE 14-day trial! Disclosure: I am/we are long STNG. I wrote this article myself, and it expresses my own opinions. I am not receiving compensation for it (other than from Seeking Alpha). I have no business relationship with any company whose stock is mentioned in this article.